Update: In Syria, Christmas events for children in four locations including Jaramana! 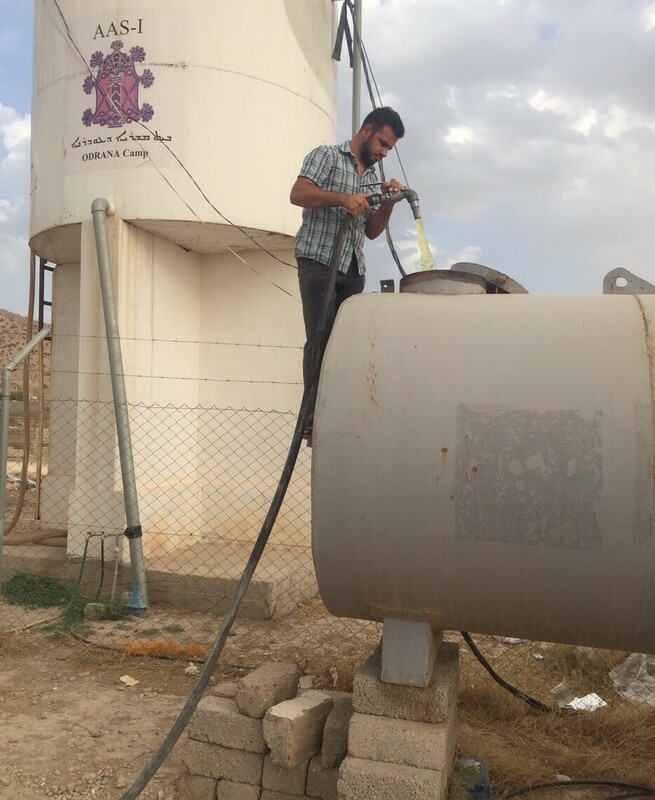 Funds sent in October & November: More than $100,000 was wired to our ministry partners in Lebanon, Jordan and Iraq in October. The funds will be used to make deposits for such things as bus rentals and catering costs for the Christmas for Refugees events. Gifts for the children and parents must be purchased well in advance and inventoried as well. An additional $200,000 will have been wired to all locations including Nigeria by the end of November. The last $80,000 will be sent in December — if we have the funds! The full budget for Christmas for Refugees this year is $380,000 and as of the day I am mailing this newsletter we do not have the full budget raised. Please pray with me that generous believers who care for the Christian children of the Middle East will send last minute gifts that will allow us to reach the full budget! 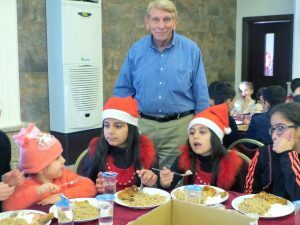 William Murray stands behind Iraqi children eating their hot Christmas meal in Madaba, Jordan. This was one of our small events in Jordan with about 200 children. Seventy-six supporters of the Religious Freedom Coalition came forward to pledge $77,031 for this year’s matching gift challenge fund. We still have not reached the matching goal which will allow us to receive the entire $77,031 match. All matching funds must be released soon to be able to move forward with all the planned events in Iraq, Syria, Jordan, Lebanon and the orphanage in Nigeria. It is still possible to cancel some of the Christmas events for the children, but which ones? A lot of prayer is needed for us to reach the total budget of $380,000 for the 8,400 children and their families we had planned for this year. Christmas for Refugees does more than provide a Christ-centered Christmas program and meal for the children. The family of each child receives a Christmas gift as well, tailored to meet the particular needs in the area where they live. Because of the increased size of the program my time in the Middle East this Christmas will be drastically expanded. I must oversee some of the larger events in Lebanon a little early in December. This requires two round trips from Washington, DC to the Middle East this year. My wife, Nancy, and I will travel to Iraq the week before Christmas and then to Jordan during Christmas week. While in Jordan, we will drive from Amman to Bethlehem to oversee some programs in the birthplace of our Lord and then return to Jordan for some larger programs there. We will not return to the USA until Christmas Day! Programs vary from area to area and church to church, but all are centered on the celebration of the Lord’s birth in Bethlehem. Some programs in Jordan and Iraq are very large, with hundreds of children present at each event. In Lebanon, there are more Christmas events held, but they are smaller. Regardless of where the Christmas for Refugees events are held the programs change according to age. Gifts are also by age and gender. It is a lot of work and it must be done right. I will be there to make sure the funds you donate are used for the best outcome — and that is to have a time to worship the Lord and bring the youth closer to the Lord. Last month, I sent you a photo of some of the contents of the hygiene kit gifts for the families. Some families in colder areas receive blankets along with a smaller hygiene kit. At each Christmas for Refugees event, we take the advice of our ministry partners who work with the displaced and refugee Christian families year-round. I am excited about this year’s expanded program, but prayer is still needed that we will be able to help all 8,400 children we plan for. Also, please pray for their safety as they travel to our events. Some areas in Syria and Iraq are still not completely safe from terror. We will hold a Christmas event for 200 children in Jaramana . This is a large city near Damascus that is mostly Christian. It was never occupied, but churches and church schools there were constant targets of fire by rebels who held areas near the city until this year. A final dramatic push by the Syrian army cleared that area just a few months ago and once again Christians can head to church without fear. Just north of the border with Lebanon, we will hold Christmas events in three different locations. One is Wadi al-Nasara . Our Christmas dinner and celebration there will be for 100 children. Nearby is Safita . In that town, we will hold three separate events, one for 225 children and two with 100 children each. The last Christmas celebration will be held at Homs Baptist Church, for 250 children. Huge distribution in December: We buy diapers for the Iraqi Diapers for Refugees program in March, June, September and December. All diapers are not distributed when the shipment is accepted. We maintain large seagoing containers which we use to warehouse the diapers. Containers are located in Ankawa, which is near Erbil, and also at a facility in Qaraqosh. The real name of Qaraqosh, from the time it was an Assyrian Christian town, was Baghdadi. The name was changed when it was overrun by Muslims centuries ago. In December, we will buy 500,000 diapers direct from the manufacturer. In all, this year, Diapers for Refugees will deliver two million diapers to Christian families in need, in and around the Nineveh Plain. This does not include a program for diapers for special needs adults. We also supply feminine pads to the mothers of the infants and toddlers. On the Nineveh Plain, the people have given us the nickname of the Diaper Ministry! The need in devastated Qaraqosh: When I last visited Iraq in June, there were just over 1,600 babies and toddlers just in Qaraqosh. This Christian town was destroyed, but residents are trying to reclaim it house by house. Even some businesses have reopened. In June, about 21,000 of the 50,000 residents had returned. I understand the number is now about 25,000. The last time I was in Qaraqosh, there was no running water in homes and all power came from generators. I understand it is not much better today. I will again be in Qaraqosh in December to see what progress has been made. The well water is as salty as the ocean and that will not change, ever. Diapers cannot be washed in well water because a heavy solution of sodium will severely irritate a baby’s skin. The inability to wash diapers is one of the main reasons our diaper program is so popular. Many homes are also beyond repair but families are moving back into them rather than living in a camp with the entire family in a one room caravan. In Qaraqosh, in June, we distributed diapers for 437 toddlers born in 2016; 572 babies born in 2017; and 396 born up to then in 2018. As the 2016 babies stop requiring diapers, they are replaced by newborns. Qaraqosh is not the only place diapers are distributed. Diapers are also distributed in other Christian towns and villages we reach out to including Karemlesh and Bartella. Please pray for the safety of all the workers helping with our Christmas and diaper programs this year! One more Iraqi program: Christmas for Refugees and Diapers for Refugees are not our only programs in Iraq. The Religious Freedom Coalition is also supplying diesel fuel for the generators at Camp Odrana. “Odrana” in Arabic translates to hope. This camp for displaced Christians is located just outside of Dohuc which was at one time a thriving mostly Assyrian Christian city. Hundreds of churches now sit virtually empty as the city is now mostly Muslim. Displaced Christians in Camp Odrana are still waiting to go home, their towns blocked by Kurds who want to take them for a future Kurdish republic. I last visited Camp Odrana in 2016 and it is my hope to be able to visit there again this year, despite the very busy schedule we will have for Christmas. Please pray that these families may return to their home towns and resume the normal lives that were stolen from them by Sunni Muslim fighters.